Long stretches of sitting can leave grown-ups stiff and little ones antsy. Since exercise is known to boost children’s cognitive performance as well as stimulate their brain growth (Dewar 2015), why not incorporate some gentle movement into your next story break? Tai chi, yoga, and your own creative take on physical expression can build the mind-body connection, and successful partnerships between multi-hyphenate authors, elementary educators, a public library, and a local nonprofit offer a roadmap for recreating a movement-filled storytime in your own space. If this is your first time incorporating movement into your classroom or library read-aloud, try starting with a book that will offer you and the children some basic guidance. 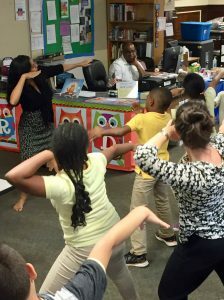 When an opportunity arose to bring author Sylvia Liu to a classroom for a tai chi-based book presentation in the spring of 2017, children’s literacy nonprofit An Open Book Foundation (AOB), which brings authors, illustrators, and their books to students in low-income settings, partnered with a D.C. public school whose terrific School Psychologist, Shannon Martin, incorporates mindfulness and meditation into her student engagement. AOB arranged several workshop for Shannon’s second graders during which Sylvia shared her book A Morning with Grandpa (Lee & Low, 2016) and led the students through an introductory tai chi routine. In Sylvia’s book, an energetic young girl answers her grandfather’s gentle tai movements with her own exuberant interpretation of the yoga moves she’s been learning at school. With descriptions of both Mei Mei and Gong Gong’s poses, plus backmatter on tai chi and yoga, the book is a perfect read-aloud to introduce mind-body movement to elementary students, even if you don’t practice them yourself. In their hometown of San Antonio, Texas, librarian storyteller Xelena Gonzáles and illustrator Adriana M. Garcia partnered with the Mission Branch Library to arrange a StoryWalk, offering patrons the opportunity to connect literature with nature and movement through a guided display of their book All Around Us (Cinco Puntos Press, 2017) (Tutor 2016). Shifting storytime to an outdoor space is a simple way to awaken your readers’ senses, and public libraries across the country offer adult classes in yoga, tai chi and Qigong, the lessons from which could be incorporated into a children’s storytime, indoor or out. If your library space doesn’t allow for outdoor engagement, follow Xelena’s lead to bring their book to a classroom, instead. With AOB at Washington, D.C.’s Raymond Education Campus, Xelena cleared desks and chairs to the walls to create an open floor space in the library, then read aloud All Around Us to the seated third graders and their teachers. After her book presentation, Xelena invited students to the open space and led them in a retelling of the story paired with tai chi movements she had learned while living in China. 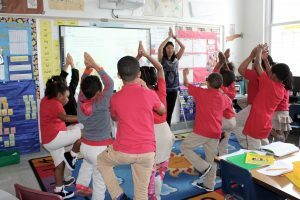 Xelena’s tai chi routine offered the eight and nine-year-olds–and their teachers–an opportunity to stretch their bodies, slow their minds, and focus their thoughts on nature before returning to their academic day. Xelena’s text doesn’t explicitly reference the physical exercise of tai chi, and your anchor text need not either, which liberates educators and librarians immensely. Stories that describe activities as varied as a walk in the woods or a trip to the grocery store can all be used as springboards for a movement-based retelling in the classroom, and the more accustomed your readers get to incorporating these mindfulness exercises into your storytime, the more animated you can get with your anchor texts. Another option is to take exercises your students make on a regular basis–such as walking to lockers or cubbies and moving from desks to a line at the door–and add a mindfulness element to those everyday motions. In fact, you may be already incorporating some classic yoga and tai chi movements into your own daily routine without realizing it, as this 2017 ALSC blog post points out. Try bringing mindfulness and movement into your literacy routine and see how the connection can improve your outlook–and the children’s! This post addresses the following ALSC Core Competencies: I: Commitment to Client Group; III: Programming Skills; and IV: Knowledge, Curation, and Management of Materials. Kit Ballenger is a youth services librarian in the Washington, D.C. area and is Program Director at An Open Book Foundation. She creates the book lists for the NPR children’s podcast Wow in the World! and is a weekly volunteer at the Library of Congress Young Readers Center. Kit serves on the ALSC Building Partnerships Committee. Dewar, G. (2015). Exercise for children: Why keeping kids physically fit is good for the brain and helpful in the classroom, Parenting Science, retrieved from https://www.parentingscience.com/exercise-for-children.html. 2 Tutor, A. (8/2/2016). First local ‘StoryWalk’ to premier at Mission Branch Library, The Rivard Report, retrieved from https://therivardreport.com/san-antonios-first-original-storywalk-to-premiere-at-mission-branch-library/.